Personal use and small commercial use, as defined in the Policies is included with all purchases. The Extended license for commercial use broadens what is allowed with your purchase. 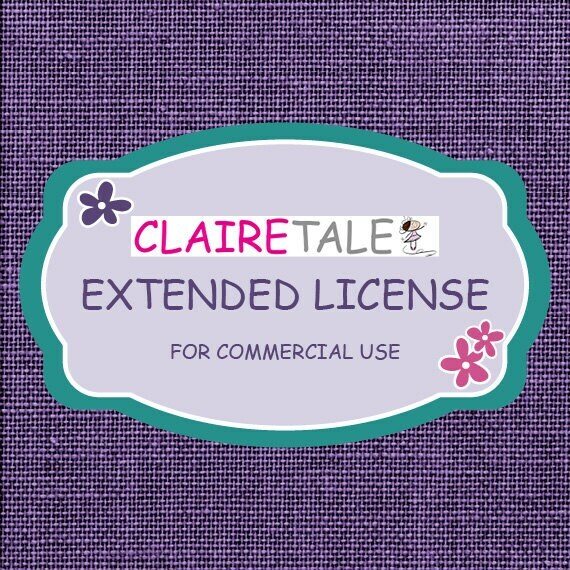 You must purchase this license if you wish to use the work of Claire Tale to create and sell over 200 items using designs from this shop. This license applies to a (ONE) SINGLE DESIGN SET or ITEM listing. 1. Upon checkout please enter the product's name that you are adding a commercial license option to in the comments section. 2. Enter the quantity desired for each design set you wish to use commercially. 3. You will receive an e-mail from Etsy with a link to directly download the Claire Tale Extended license for commercial use PDF document containing the same information as presented below shortly after payment is confirmed. 4. For your records keep your receipt of the transaction and the Claire Tale Extended license for commercial use PDF document. Please read the commercial use terms carefully and contact me if you would have any question. This Extended license grants you, The Licensee, a non-exclusive, non-transferable right to make use of the digital design file you acquire. By purchasing this Extended license for commercial use, you accept and agree to adhere to the following conditions. • Advertising (digital and print), videos and company websites with unlimited impressions, social media sites, blogs, banners etc. • Printing on merchandise for sale; this includes but is not limited to T-shirts, canvases, paper and stationery. • Photo albums, books, photographs. • Branding including calling & business, cards etc. • Most (see below) instant downloads & printables; flattened image only. • Printed arts & crafts, jewelry, accessories, home decor and clothing created & sold by you. • Labels, stickers, tags, for your artwork; please do not resell “As is”. • Sell or share, as is or altered, on any website or elsewhere. • Claim my art or files as your own. • You may not sell your item made with my art/products as is, altered or part of these collections: scrapbook kit/collection or for photography template kit/collection. • You may not use any of my art/products where they are the main focus to create instant downloads, printable items, collage sheets or scrapbooking materials even with a Extended license for commercial use. Great value license, and fantastic customer service. Great - sensibly priced extended license, ideal for small business use. Thanks very much. Great - how nice to have a sensibly priced commercial license. Well done Claire! Very pleased. Thank you.